Game Night: 15 May 2007 – Marvel Heroes (Part 1) | Kris Johnson's Blog…sort of. I think I’m going to build a Gamesignal and install it on the roof above the garage, with a switch downstairs in my office. Then when I want the Game Night crew to assemble I’ll just flip the switch, a powerful beam of light will bisect the sky and our emblem ((Note to self: we need an emblem; and a theme song.)) will shine brightly in the darkness for all to see, ((Projected on the … uh… stratosphere, I guess; or perhaps a giant screen in geosynchronous orbit.)) signaling Chris, Gus, Jeff and Miscellaneous G™ that the time of the gaming is upon us. Yeah, that’s definitely the way to go. As it stands, Game Night is coordinated via e-mail, which seems pretty mundane by comparison. Unfortunately, due to some manner of SMTP wormhole or IMAP confuddlement, Jeff didn’t receive confirmation that Game Night was go for launch on Tuesday and he was understandably absent. I’ve got to believe the Gamesignal would be far more reliable. Miscellaneous G™ and Chris arrived at the International House of Johnson shortly after 7:00 and gaming commenced around 8:00, following consumption of various snacks and chitting of various chats. We decided upon Marvel Heroes, foolishly thinking that we could complete an entire game before Gus’ scheduled 9:00 arrival time. As it was, we hadn’t quite managed to finish an entire game round before Gus arrived. We briefly considered switching to something else, but then decided to simply deal Gus into the game already in progress. The idea behind Marvel Heroes is fairly simple: each player commands a team of heroes who troubleshoot mysterious occurrences (called Headlines) in and around Manhattan. Successfully troubleshooting a Headline means collecting Victory Points; failing means the heroes get sent home with their web-shooters or adamantium claws between their legs (embarrassing and uncomfortable). 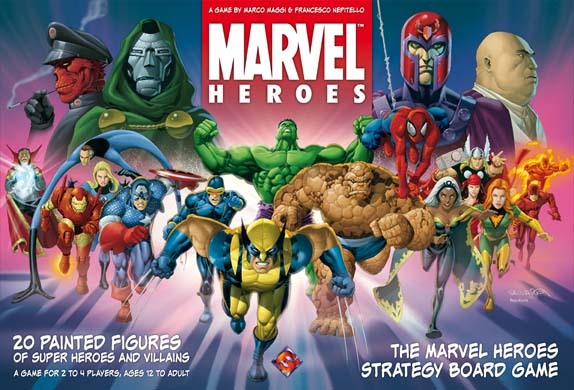 Unlike Arkham Horror, another Fantasy Flight title we’ve played at Game Night, players in Marvel Heroes aren’t cooperating with one another to overcome a common foe, they’re competing against each other for Victory Points. It wouldn’t do to have the heroes battling one another, though, so to aid in foiling their opponents each player controls a Master Villain — the nemesis of the team to his or her right. Miscellaneous G™: The Avengers (Captain America, Iron Man, Thor and Hulk). The Avengers’ nemesis,The Red Skull, was controlled by Chris. Chris: The Marvel Knights (Spider-Man, Dr. Strange, Daredevil and Elektra). The Marvel Knights’ nemesis, Kingpin, was controlled by KJToo. KJToo: The Fantastic Four (Mr. Fantastic, Invisible Woman, Thing and Human Torch). The Fantastic Four’s nemesis, Dr. Doom, was controlled by Miscellaneous G™. Teams assigned, it was time to get cracking. The basic unit of the game is the Game Round, which is broken into three phases: Setup, Planning and Mission. During the Setup phase, the game board is prepared. In the first round, six new Headlines are placed on the board (one for each area of Manhattan), four Story cards are dealt onto the Story track, and various tokens — indicating such things as the current Game Round, Victory Points for each team and Trouble Level — are placed on their appropriate tracks. In subsequent rounds, the Story track is advanced, the Game Round advances, and Headline cards are dealt into locations that were investigated in the previous round. The planning phase is where all the strategy takes place; well, in theory, anyway. Team receive Plot Points based on a number of factors and spend those points to activate heroes and play Ally cards. The idea is to activate heroes whose skills and troubleshooting levels best suit one or more of the available Headlines. Right. Boring. Where are the epic battles? Where are all the shield-throwing, web-slinging, Hulk smashing, eyebeam-shooting beatdowns? Fear not, true believer! Once we get past all the setup and strategery…it’s clobberin’ time! The Mission phase is all about applying boots to the posterior and taking note of monikers. Okay, there’s some other stuff going on (like moving heroes, healing heroes and such), but it really boils down to action. In fact, each Mission phase is broken into five Action Rounds. Typically, the first action is to move your team to a location and the second action is to introduce your heroes’ fists to some villains’ faces. In the first round, Miscellaneous G™ sent Thor and Iron Man to Lower Manhattan, Chris sent Elektra and Spidey to Brooklyn, and I sent Mr. and Mrs. Reed Richards to The Village. Instead of troubleshooting in the second round, Miscellaneous G™ chose to take a Story Action and build up his hand. The real action started with Chris’ turn when Elektra investigated rumors of mutant monsters prowling the sewers beneath Brooklyn. Any time a player troubleshoots a headline, all the other players have an opportunity to play cards (Villains and Agents) that make it more difficult for the hero to triumph. When Elektra descended into the sewers, she didn’t find mutants waiting for her there; she found The Vulture, a Villain card that I played from my hand. Once a Villain has been played, he or she becomes the Lead Villain for that encounter, and the other players can play additional cards as backup effects — cards that allow the Lead Villain to use sneaky tricks during combat to gain an advantage or otherwise inhibit the hero. Unfortunately, The Vulture is an old man, and apparently senile to boot. Why he chose to confront Elektra in the confines of the sewer rather than engaging in an aerial battle amidst the towering skyscrapers high above is anyone’s guess, but the end result was a trip back to Codgerville Prison and Chris picking up several Victory Points. Meanwhile, in another part of the city, the ever-elastic Mr. Fantastic investigated the origins of a mysterious column of energy, only to find that it was yet another fiendish plot by Latverian dictator and Darth Vader wannabe, Dr. Doom.Never mind that Dr. Doom made his first appearance fifteen years before Darth Vader. Though the bad doctor wasn’t actually present, his machinations were felt in the form of an increased Trouble Level — one of several ways in which a Master Villain can attempt to alter the outcome of a Mastermind Headline. Miscellaneous G™ (controlling Dr. Doom) could also have opted to arrange a direct encounter between Mr. Fantastic and the Master Villain, but chose not to; instead, Chris played Avalanche as the Lead Villain and Miscellaneous G™ threw the Crimson Dynamo into the mix as a backup effect. Much to Doom’s dismay—not to mention Miscellaneous G™’s, as his disdain for Mr. Fantastic is the stuff of legends—Avalanche proved to be no match for the leader of the Fantastic Four, and I collected the sweet, sweet Victory Points. It was a promising start for me, but little did I know how quickly my fortunes would take a turn for the worse. When Thor arrived on the scene in Lower Manhattan to investigate reports of a UFO crash, instead of little green men he found a big green-and-yellow man: Electro. For those who may not know, Electro’s claim to infamy is his ability to manipulate electricity, while Thor is the Norse god of thunder who wields the enchanted Uru hammer, Mjolnir, and says “thee” a lot. Smart money was on Thor, and the son of Odin did not disappoint, leaving the only real question whether I should say that he hammered, nailed, or pounded Electro. Chris, meanwhile, had moved Elektra to Queens, where she found several horribly mutilated bodies… and Hydro-Man. Now, Hydro-Man is essentially made of living liquid and can control nearby bodies of water. Even so, he’s still a second-rate villain in the Marvel Universe. Elektra, on the other hand, is a Greek ninja assassin ((No, seriously, Elektra is a Greek ninja. And an assassin. A Greek ninja assassin. Oh, and her last name is Natchios, which doesn’t sound at all like “nachos”.)) who was killed by Bullseye and then came back from the dead. That’s pretty badass. On the other other hand, Hydro-Man was being assisted by one Mortimer Toynbee, also known as The Toad. The combination of Hydro-Man and His Amphibious Friend proved too much for poor Elektra, and the villains (wait for it) mopped the floor with her. Elektra’s ignominious defeat marked the end of Game Round One, as well as the arrival of Gus. Rather than abandoning the game in progress, we decided to give Gus the X-Men, shuffle the nemeses around a bit, and continue the ongoing battle for truth, justice, and a slogan that didn’t belong to a competing comic book company. Excelsior! Gus sat to my left and took Dr. Doom’s green hoodie from Miscellaneous G™, who in turn donned the maroon-and-purple helmetAbsolutely not double entendre. of Magneto, the Master of Magnetism. Our musical chairs mini-game complete, we proceeded to Game Round Two. It’s actually “bated breath”. I believe “bated” is, in this case, short for “abated”, so the phrase means you’ve stopped breathing, not that you’ve been gnawing on nightcrawlers. I’ll find the time. My audience demands it! It’s coming soon. Possibly later today or sometime this evening.